In this era of globalization, new products and services are introduced daily with the rapid advancement of technology, and thus, eco-innovation became important in order for the global society to respond to and overcome problems such as climate change, low-efficiency and resource crisis. ‘Eco-innovation’ is known as ‘new modified process, techniques, practices, systems, and products that avoid or reduce environmental harm for sustainable development.’ Developed nations recognized eco-innovative technologies tackling climate change and other environmental problems as a driving force in creating new industry and job since long ago, and they accelerated their efforts in preoccupying this global market ever since. In order for countries to succeed in the global eco market, they need to be proven successful in their own domestic markets first; therefore, it is important for governments to actively engage in fostering domestic eco markets. Moreover, in achieving eco-innovation, government regulations should be predictable, consistent, challenging with realistic targets at the same time. In addition, market promotion measures for eco technology innovation must be technology-neutral in not pressuring companies to use certain technologies only. Sound scientific and manageable solutions are required not only for emerging environmental issues, but also for shortcomings in existing environmental policies. 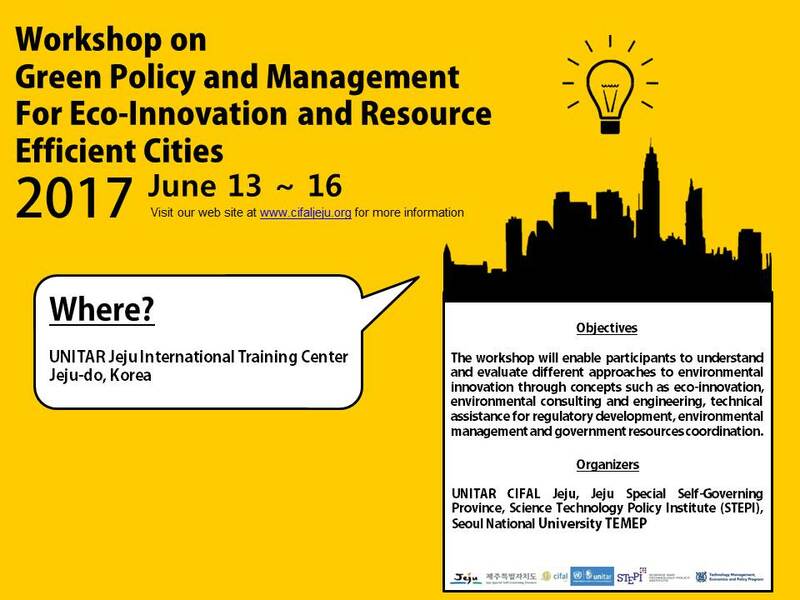 In this sense, UNITAR CIFAL Jeju workshop will provide participants with information and understanding of the concept of eco-innovation, environmental technologies, sustainable production and consumption, resource efficiency and green policy and management. A successful completion of the workshop will enable participants to understand and evaluate different approaches to environmental innovation through concepts such as eco-innovation, environmental consulting and engineering, technical assistance for regulatory development, environmental management and government resources coordination. ⑤ understand and apply green policy and management strategies to different situations. ① submit necessary documents on time, i.e., registration form etc. ② complete and submit pre-training readings and assignments, i.e. case studies, self-assessment, etc. ① Participation is subject to approval of the application by UNITAR CIFAL Jeju. ② Selected applicants will be notified individually. ① UNITAR CIFAL Jeju provides a LIMITED financial assistance with the airfare to Jeju-do, Republic of Korea. ② Local expenses (venue-to-venue transportation, accommodation and meals) during the workshop will be covered by UNITAR CIFAL Jeju. ③ All other expenses are the responsibility of the participants. 2016 Top Markets Report Environmental Technologies (Rep.). (2016).International Trade Administration.